Boy, It Just Doesn’t Stop! To make matters worse, he’s now touting President Obama’s rhetoric when it comes to expanded background checks. TODAY, the Senate Judiciary Committee is holding a hearing on Senator Dianne Feinstein’s anti-gun bill…which would BAN millions of commonly owned semi-automatic firearms and BAN ammunition magazines that hold more than ten rounds. YOUR SENATORS NEED TO HEAR FROM YOU RIGHT NOW!!! Please call both of your Senators today at (202) 224-3121 and tell them to OPPOSE the Feinstein Gun Grab bill. Tell your Senators that President Barack Obama’s own Justice Department recently reported that any ban on semi-automatic firearms WILL NOT WORK…unless it includes mandatory gun buy backs, which is federal GUN CONFISCATION! Senator Feinstein herself told CBS’s 60 Minutes that if she could get the votes “for an outright ban, picking up every one of them — Mr. and Mrs. America turn ’em all in” she would do it!!! If you live in Arizona, please call Senators Flake and McCain, TODAY! Hell if you live in Flotsam’s Mistake, NJ! call them. And call your own Senators, too. I’ve called and sent emails, more than once. They need to hear us…RIGHT NOW! Don’t count on someone else to do it. Take action! Call the number above an let your voice be heard! I used to hang with a nice married couple. They are good friends, but they moved away. Fortunately, this was after they became my shooting students, and went on to become teachers, themselves. When the s*** comes down, you will need ‘X’! Self-defense oriented folks already are familiar with such precepts: Jeff Cooper’s Principles of Personal Defense is all about our attitude. Practicing a snap kick for 1000 repetitions, or a pistol presentation 1000 times may help you with you physical self – your muscle memory. But, readiness is not just about the physical. You should go and read the whole article at the link above, and remember, prepping isn’t just how many guns or rounds-of-ammo or bandages or water filters you have. What you do with those tools is entirely dependent on your attitude. Just a heads-up to those who may have missed it: the Federal Deposit Insurance Corporation changed its rules as of the end of last year. For the past two years it provided ‘unlimited insurance coverage of noninterest-bearing transaction accounts‘. If you had ten accounts with seven different institutions, all of them were covered for the full amount deposited in them. … remember, total bank deposits in the U.S. are somewhere around TEN TRILLION DOLLARS and the FDIC deposit insurance fund as of March 31, 2012 had a whopping $15 BILLION. Bottom line: if you think your bank deposits are “insured” or “safe” because of FDIC protection, you’re totally irrational. Not that I have $250,000, anywhere. Frankly, I’m lucky enough to have a positive balance every month two weeks prior to payday. But many good, hardworking folks do have more funds then they spend. And, good for them! A word to the wise. They don’t practice outside the box. I wrote earlier this month regarding my two years of formal training in martial arts. Not much, I know. About 15 years later, I actively shot in I.P.S.C. – style competition for about a year. There is a similarity in these disciplines. Most martial arts training (I’m speaking of Asian-based) begins with a set position. A formal stance from which one begins – either ‘sparring’ (usually play-acting as through striking one’s opponent), or kata (aka forms), going-through-the-motions as if encountering an opponent. Shadow boxing. Responding to an imaginary adversary. The problem in both these situations is muscle memory. We revert to that which we were trained to do. One responds to a fist to the face by an outward-extended block, trapping the arm and stepping in with a counter strike. One sees one’s adversary present a pistol in one’s direction, and the response is immediate – Grip, Clear, Click, Smack, Sight – or some variant, as one moves into Isosceles or Weaver – feet into the ‘correct’ position to respond. WRONG. At least wrong in the real world. Training is good. Dry practice, repetitive presentations, trigger control, sight alignment, the compressed-surprise break. Even practiced stances and grips. All good. Competition is good, especially active competition as opposed to just punching holes in paper, dueling-style. But, those are not enough, and can set in some dangerous muscle-memory habits! Remember they used to say in malfunction clearance drills Tap, Rack, Bang? They changed it to Tap, Rack, Assess, because some folks had malfs, cleared their firearm and came out shooting. Reflexively. The same thing applies in our training. If we train to respond with B follows A – bad things are happening, we must attain our proper stance and grip, and use both hands, and have our feet correct – we won’t have the time to find cover and respond appropriately. We will be dead. The venerable Bruce Lee called kata vertical death – because it set a pattern of muscle memory and took unneeded time. Don’t just practice B follows A – try presenting and shooting weak handed, from prone and supine, and in a chair; and holding a heavy sack in your strong hand. If someone send a fist to your face, don’t automatically do a ‘standard’ response. Dodge the fist simultaneously doing a stop kick. Think outside the box! 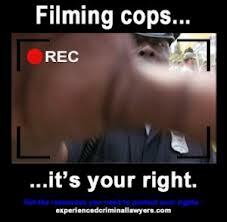 Armed or unarmed. With the ubiquitous-ness of digital cameras (usually attached to cellular telephones) it’s only logical that the civilian populus would film any actions taken by the constabulary in public. Think of Rodney King – squared. One would think this is only fair, as most populated areas are now replete with cameras either filming the public willy-nilly, or those privately-owned that may be accessed, like ATM cameras. AND, police dash cams. And it would make sense to keep such actions free, as open government is a desirable thing. Not to mention cases such as Kyllo v. United States and Boyd v. United States, which reaffirmed the English Common Law which said the eye cannot trespass. 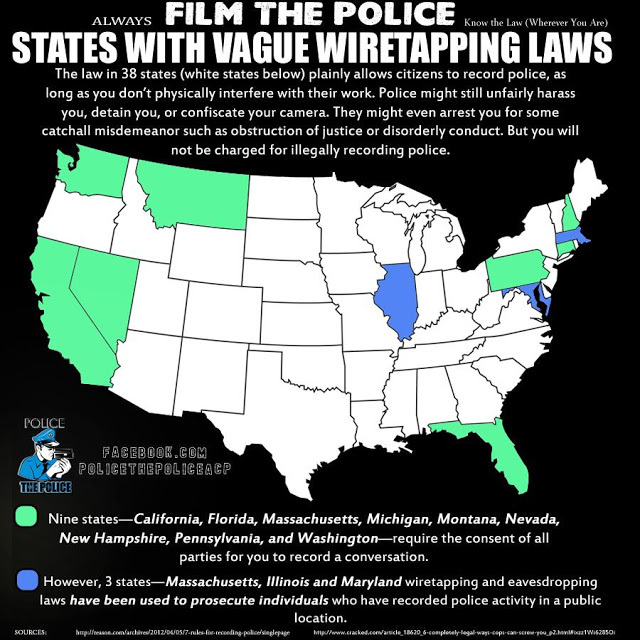 As more and more of the public are photographing and filming police activity, more States are acting to suppress the right of a free people to record such actions. Why is that, if the government is acting within the law? Asking permission to engage in free behavior in an open society? And out-and-out prosecution in certain jurisdictions? Outrageous and disgusting. Expect more of this coming to your town down the road. Because governments never rarely* expand to promote individual freedom. *recent changes in self-defense, gun possession, and CCW laws, notwithstanding. I even saw a blip on the radar about another State looking at Constitutional Carry. Too bad the concept of freedom isn’t simply the default for all natural rights. (for my Jewish friends) is the celebration of PURIM! They are the official cookies of the Jewish holiday Purim. Marked by costume parties and copious drinking (who knew that Jewish folk got crazy? ), Purim is a raucous Jewish holiday that celebrates a foiled plot to kill all of the Jews in ancient Persia.Go to the link above and see all the delicious Jewish cookies! (NO, not Elizabeth Banks) along with a history of the holiday and many recipes!TWO of the highlights…(well, three —–> ) Try this Reese’s-esque cookie interpretation. Gluten-allergic folks can celebrate not only Uncle Mordechai’s heroic rescuing of the Jews, but also this rice and coconut flour variant on the classic shortbread Hamantaschen dough. Great. Just like Brigid’s food posts, I’m craving some. Hoist on my own petar’. Sigh. You don’t have to be Jewish to enjoy! L’Chaim! Big Brother Watch tells us the tale of a mouse – a big, internationally corporate mouse. 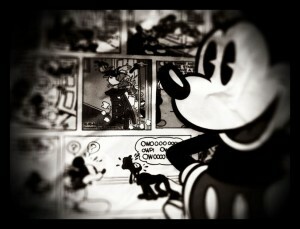 It appears DISNEY is planning on using RFID technology on it’s lab rats customers! Today’s Independent reports on the latest front in retail convenience and privacy, with Disney’s plans to utilise RFID technology. “The latest kerfuffle has resulted from Disney’s plan to introduce an RFID wristband – “the MagicBand” – at its parks during 2013. It would function as a room key, a parking ticket, a pass for certain rides, a payment system and, if you opted in, a personal ID that would, say, allow Disney characters to greet you or your children by name. The online reaction to this plan ranges from “awesome” to “terrifying”. Go and read the whole article at the above link. Perhaps it IS a small world after all – and a less private one. When I worked at my last job, we did many things on a computer terminal. I was there over 20 years, and saw many changes. Of course, as the technology evolved, so did our machines – usually about 4 years after everyone else did. They kept harping about A PAPERLESS SOCIETY, but kept us using paper and printing on it. More electronically, but, eventually paper was involved. Now, my roomie prefers the really soft, cushy roll of paper. You know the kind – advertised by cartoon bears in the woods. Sadly, roll it about two-times-over and one is down to the cardboard tube. Time to change the roll. 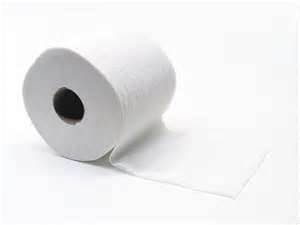 I prefer the 1000 sheet-single-ply. If they could, they’d rate it with a sandpaper grit number. More sheets; don’t have to change the roll as frequently. My experience is the female-of-the-species prefers as my roomie does. Better soft than abrasive. This has evolved into two roll dispensers in the main bathroom, his and hers. And ‘roll follies’ when one roll is needed upstairs, but the reloads are downstairs. But, all-in-all, we work it out. As we humans know, unless one is in a less-civilized part of the World, eventually, paper is involved. The essay IS a worthy read! I now share a house with my roommate, a cat and three dogs. This is not about the animals. And my roommate, who is quite fetching herself asks me, “So, what’s MY flaw?” – with a big smile. OOPS. Danger, Danger, Warning, Will Robinson! Of course, she does have them one, but I’m not about to tell her! Perhaps it’s constantly denying her beauty. A real modesty and self-deprecation that makes her even more attractive. After all, if she thought she was all that, she’s be insufferable.